It is 5:20 PM Saturday evening here in west Michigan. It is a wet humid damp gray warm windy evening. The sun is suppose to come out this evening. Carol just left to take Cora Leigh home down the street. Caleb and Emily have been moving their stuff into their new house down the street from us. Emily's Dad has a truck and they have been bringing stuff to their new house from their apartment in Grand Rapids. I took a tour of Caleb and Emily's house and it is nice. Josie Joy spent the night with us. We watched Cora Leigh this afternoon while Caleb, Emily, and her Dad worked at the house. Vickie Emily's mother watched Josie Joy. Right now I am feeling overfed and tired. Carol cooked a ton of food for lunch today. Everybody was here for lunch except Emily. Emily stayed at the new house and painted their kitchen. There is not much to report this evening. This morning Carol, Josie and I went out for breakfast and then went grocery shopping. When we got home we put away the groceries and then walked down to Emily and Caleb's new home. When we came back here we had lunch. After lunch folks left to go back to the house. Cora Leigh stayed with us so she could take a nap. I took a nap down in the lower level and Carol took a nap upstairs. So existence keeps going by. Last night is a blur. I suppose I will close to rest my stomach. Tomorrow is a Sunday in the death flow. The last book I read from was titled, 'The Collected Stories Of Machado De Assis' Translated By Margaret Jull Costa And Robin Patterson. I did get a book in the mail this afternoon titled, 'The Miniaturist' a novel by Jessie Burton. 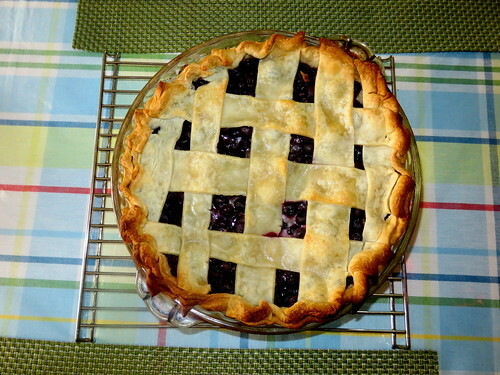 Carol made a blueberry pie this morning for lunch.